I had a conversation today with a new leader who is taking up Salsa completely of his own volition. Without his girlfriend pushing him (she’s not even going to lessons with him), and it was his idea to do it in the first place. He’s committed, he’s young, he’s clean and cute. He’s the kind of leader all the women say they wish there were more of! But, at a social practice after a class he was snubbed by a more experienced follower who wouldn’t dance a song with him when he told her he was new. In fact, “Do you know this dance?” was her response to him having the guts to ask. In personal finance, there’s a rule of thumb about paying yourself: take 10% of every paycheck to save for the future. I have a challenge for all dancers: let’s apply the 10% rule to dancing. New dancers are our futures. 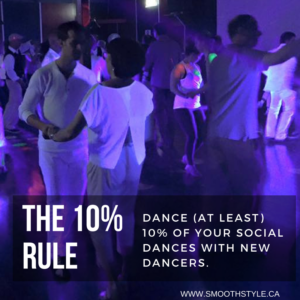 How about making 10% of all your social dances dances with beginners? Starting right now. And if you’re an instructor make that 25% or more. In anticipation of some excuses I have heard, I have a few responses to common reasons people say they DON’T want to dance with beginners. 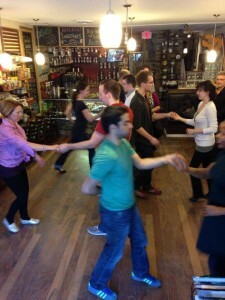 It’s boring/I won’t get better dancing with beginners. Really? What I like about dances with beginners is that it’s my best chance to practice my own stuff, be it technique or a styling I’m trying to nail down, etc. Yes, sometimes you’re not totally up for it. Sometimes you’re mentally exhausted or physically exhausted. But for the most part, there’s always something you can take away from a “basic” dance. I’ll pick up bad technique. If you believe that, please come and ask me for a private lesson, as you have probably never been shown how to dance your own dance with anyone. I’ve paid my dues. That’s not how the 10% rule works. The 10% rule is valid forever, until you retire. If you’re an active social dancer, you have a vested interest in helping the community to develop and grow. So keep “paying your dues”.